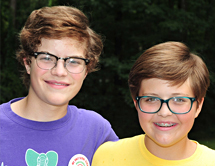 At the very young age of 7 and 8, this Georgia based brother and sister duo were motivated to start a ‘company’ that could help protect endangered species. The sight of sea turtles covered in oil and suffering due to the BP spill drove them to tears and into action—collecting and delivering much needed supplies to animal cleaning stations down in the Gulf. It was during this ocean clean-up adventure that they learned about the devastating impacts of plastic on ocean wildlife. This inspired them to create an award winning plastic pollution curriculum that is has been adopted nationwide and is currently being tested for distribution in the UK, Australia, and South Africa. Each time Olivia and Carter learned about the fate of threatened animals they were moved by despair and dreams of keeping them safe, so the emotional response ‘OMG’ seemed to be the perfect battle cry and foundation for their organization. ‘One More Generation,’ (OMG) is a 501 c3 they formed with their dad to help protect endangered species for the next generation of children to experience. Now 14 and 16, these young activists have spent more than half their lives committed to raising awareness and making big waves of change for ocean conservation.